KHOTANG, Feb 19: Tuwachung Jayajum Danda, a renowned historical tourist site in Khotang is under high risk of landslides due to negligence in constructing road at the base of the mountain on which it is situated. Apart from the recent road construction, stone mafias have targeted the hill on which the historical site is situated in Tuwachung Municipality-7 for a long time. The site has religious significance for the Kirats. Locals claim that the stone mafias and the contractors constructing the road have been digging it haphazardly. Locals have even formed a committee for the conservation of the hill. According to Rakesh Rai, president of the Tuwachung Jayajum Danda Conservation Committee (TJDCC), the hill has been under risk due to reckless act of the stakeholders. He asserted that the decision to open the road track through the hill was taken by the locals, not the government. As part of the road construction agreement, the locals had agreed to provide stone free for the construction. “We had agreed to let the contractor procure stone by digging the hill for constructing the road. We knew that road couldn't be made without getting stone from the hill. However, we did not expect the contractor to dig the hill for stone so recklessly,” Rai said. “This hill is our pride and identity. The way they are digging it reflects utter carelessness and we are now seriously concerned about it,” he added. Lama Nagarjun Construction Company is tasked with the responsibility of opening the track. The company is also blacktopping Bijule Hurlung section of the Mid-hill highway in the district. Rai stated that contractor has been excavating wider area then required. He claimed that it is being done so because the contractor wants stone from the hill for other purposes than constructing the road. “They have been excavating more stones then needed so that they can use it for purposes other than constructing this road,” he said. Rai further stated that the committee is not against constructing the road but maintained that it has to be constructed without affecting the integrity of the hill that has archeological, historical and religious significance. “If we love our culture, our identity, our ancestors, we must not let this place be destroyed in the name of development,” Rai said. He stressed on the need to construct the road without affecting the integrity of the hill. He warned that if the construction of the road continues the way it is done presently, it would seriously damage the hill and there would be more loss then gain to the locals. “We need roads to develop our locality. 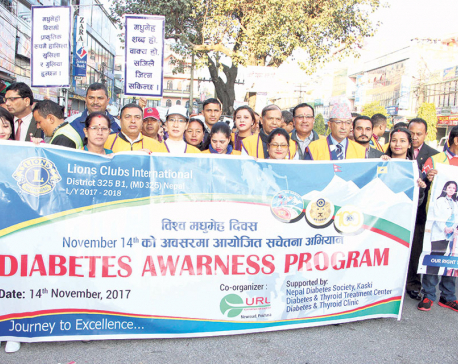 It will connect us to other areas, for instance, Kavre. However, if we lose our most important heritage during the process, it will be irrecoverable loss,” Rai said. 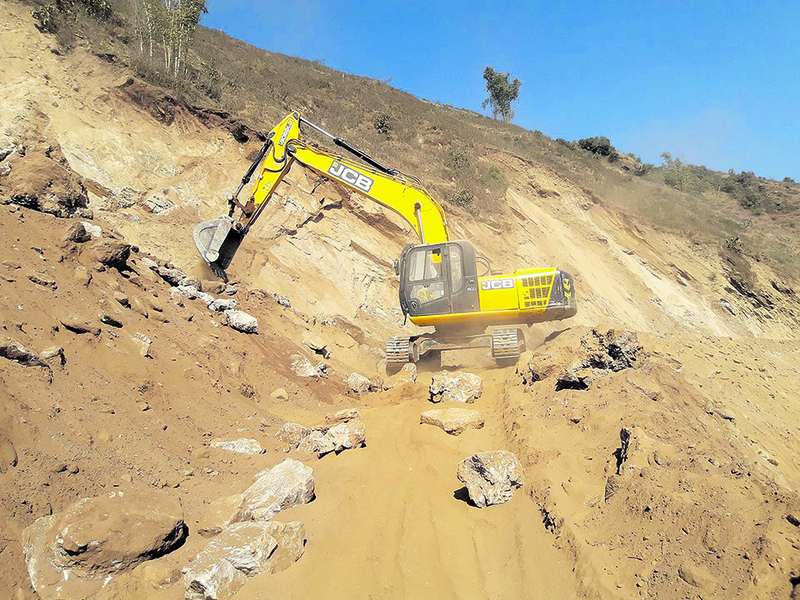 Alarmed by the haphazard digging of the hill, the residents called on the municipal office for involving the police to monitor the contractor's activities at the site. Accordingly, the municipality has urged the Nepal Police to help them in preserving the site. Mayor of the municipality Iwan Rai stated that the concern of the locals is genuine. Widening or opening of road cannot be an excuse to destroy a place that has historical, archeological and religious importance. “We are highly concerned over the matter. This hill is of religious, cultural, and historical significance to us. Many tourists visit it for the same reason. So, we are seeking 'sensible development' rather than haphazard development,” he said. Commenting on the measures his office has taken, he said that further construction work at the site would be carried out under the inspection of the police. Furthermore, the contractor has agreed to carry further construction of the road by trying to affect the hill as least as possible and for involving expert engineers for the same. “Development and conservation of environment should go hand in hand, we are serious about it,” he said. Stating that a narrow road track had been opened in the past, he said that the new construction would be focusing on widening it without affecting the hill much. So, there is no need to dig the hill much for the construction now. “We are talking with the contractors for minimizing the impact of the construction on the site. We are doing our best to keep the site intact for generations to come,” he stated.